In the early 1990s Robert “Bob” Gardner from Willits, California created what would eventually become the Buddy Bike. Bob, a bicycle enthusiast, was inspired to customize a bike to ride with his young son Isaac. Bob had the innovation of adding a seat and foot pegs in front of his seat. Isaac enjoyed riding in front but wanted his own pedals so Bob welded two bicycle frames together. He called the unique tandem bicycle the Love Bike and began production in 1996. In 2003, Barry Nelson, the father of a child with autism, began searching for a bicycle to use with his son Jesse. Barry enjoyed outdoor activities with his other children but had difficulty finding an activity that he could share with Jesse. Barry tried many options without success until he purchased a used Love Bike. Barry enjoyed the time that he spent with Jesse on the Love Bike and wanted other families to have the same experience. In 2005, Barry purchased the patent and remaining inventory of the Love Bike with a Trust benefiting Jesse and he changed the name of the bicycle to the Buddy Bike. In 2005, Barry hired his long-time law firm Marketing Coordinator, Shelley Patterson as the Director of Marketing and Business Development of Buddy Bike. Shelley manages all aspects of the business including product development and provides excellent and timely service to customers and bicycle dealers. She takes pride in representing a company that provides a quality bicycle that changes the lives of many families. Shelley strives to build a company that promotes cycling and brings the cycling experience to as many special needs families as possible, especially those who might not otherwise be able to ride a bicycle. 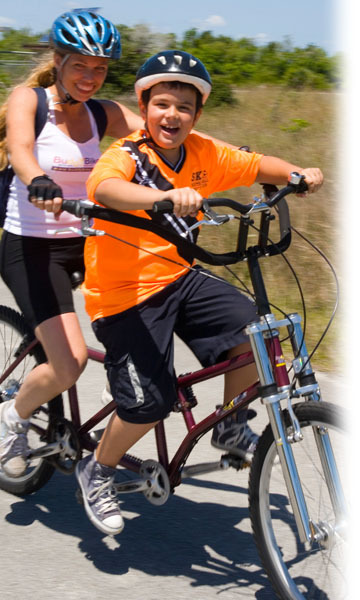 Buddy Bike, LLC is the manufacturer and distributor of The Buddy Bike, an alternative inline tandem bicycle. Buddy Bike, LLC operates from its office in North Miami Beach, Florida. Fairing Industries in Chino, California coordinates product development, manufacturing and shipping. The Buddy Bike is currently manufactured in China. Since founding the business in 2005, nearly 900 Buddy Bikes and Love Bikes have been sold worldwide.